ROASTED EGGPLANT SLICES WITH ANCHOVY SAUCE - p. 54 - With so many beautiful eggplant varieties available at this time of year I can always count on having some in the fridge ready to go. Last weekend I was in need of a quick antipasti and this fit the bill. The sauce is what takes this dish from good to great and though you definitely can taste the anchovies, their flavour is subtle and works beautifully with the roasted eggplant slices. I loved the texture of the eggplant in this dish. K said he would never have known this was "not" a meat dish! High praise from my carnivore!! Love the benefits of a low-fat, low-carb lifestyle but not the blandness of bunless burgers and broiled fish? Look to the Mediterranean for inspired, fresh, and healthful ideas, suggests award-winning cookbook author Diane Kochilas. 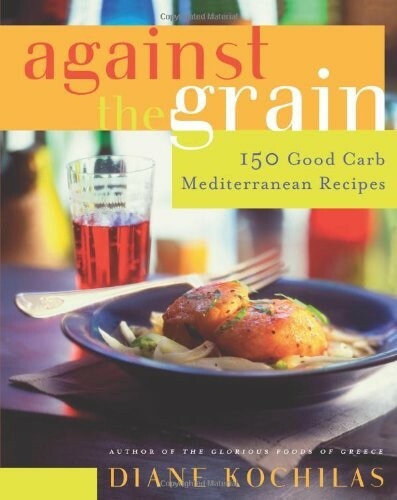 In Against the Grain she presents 150 fresh, robust, easy recipes for real, unprocessed food, including vegetables, fruits, seafood, poultry, and other meats--each with low carb counts per serving--that are sure to satisfy Americans' growing demand for low-carb foods. In addition to such classics as Greek Stuffed Eggplants with Kalamata Olives and Herbs, Chicken Cacciatore, and Spanish-style Baked Omelet with Chorizo and Vegetables, there are innovative, exotic new dishes including Calamari Pesto, Moroccan Style Lamb Chops with Fennel, Black Olives and Orange, and Sauteed Shrimp with Saffron Egg-and-Lemon Sauce. With Against the Grain home cooks can say good-bye to basic diet fare and enjoy a wealth of healthy, hearty Mediterranean dishes that are good for them too.